I LOVE the scarf, it's ace! Love love love it!! Fab job!! I started this scarf last night. It's going to be a Christmas gift for my niece. My only issues is I can't access Magknits' Crime of Fashion. Any chance you'll share a copy of your chart? Thanks! I LOVE your idea of using a fleece backing. What a great way to hide the intarsia! 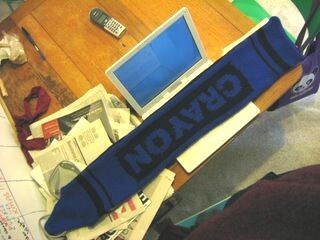 This crayon scarf is infamous. hi, Thanks for posting this adorable pattern! I have created a chart on Excel to go with this pattern. If anyone wants the chart just e-mail me @ koszalka@terraworld.net. I also made it double long and double sided. So cute! That is a great scarf!, You could make it bigger and it could also make a fabulous small rug for a childs room! It's very nice. I love it. This so creative because I'd like to buy a crayon scarf, but it's so difficult to get one like that in the stores, I'm happy because I can make my own scarf with materials you provide us in here and the steps to create it. Now pause to draw yourself out a chart for the label. I'd pass on mine but its paper and covered in scribbles, its easy enough to do your own. You might want to change the shape at the ends of the label, I'm not sure about mine. I used the letter grid from Magknits' Crime of Fashion scarf. I love your idea, is very good i will try to do it at home. Beautiful idea..I love this crayon scarf..I am also trying to made such kind of scarf. really cool. I love crayola crayons! It looks just like it. Your scarf is so beautiful..I was looking for the same piece..Thanks for sharing design..
Great post thanks fro the share!!! Great post..... thanks for sharing. Doing stuff like this one you just made is so fun, especially if you are on a vacation, or simply have nothing to do, isn't it?! :-) Nice scarf, huh! Your brother must be happy to accept it as a gift! Great scarf, thanks for sharing the pic. These are nice party pics here. Lovely images taken. Thanks for sharing them. This is a super interesting. I wish to have one like this. I don't understand what exactly wants to express the above person through "super interesting" term. holy god.. you have done a nice work.. you must have taken days for it to complete it.. good man.. I will continue to update the other patch..
very bad to know about this. Exclusive Netent Casino bonuses would be the Best Casino Bonuses . To experience no recourse using Online Casino Bonuses you can test No Deposit Casino or No Deposit Bonus .Make sure that Free Play Casino may bring you real cash winnings. Its really a nice and interesting post. Keep it up. Very nice concept. Nicely presented. I loved The blog. Very useful blog. I would like to thank the author. process of making crayon scarf is really interesting and easy.It can be a sweet gift for any dear one. Nice scarf, i like it... i could wrote another word for example? Isn`t it? pretty and lovely . I am gonna make it my own . Welcome to scarf world. You will satisfy with them. I like color of this scarf!? It's excellent that your blog is full of worthy information for your readers. How to burn 3500 to 4000 calories of stored fat and LOSING UP 1 to 2 POUNDS A DAY..
Its a bit short as a scarf for my tastes but it's backed with fleece which makes it super-warm so you don't need to double it round your neck and goes once-round quite neatly. Very interesting share! Thanks for this great stuff. Keep sharing more informative stuff like that. Actually I'm so excited to find your blog, I couldn't find so worthy information on this matter. Krugman was the economist that got me first interested in economics with his popular books. that looks funny . i want one like that. I’m extremely pleased to read through this original content! Your site appeared to be extremely completely unique and possibly a must read! Compared with other posts, your site was full of subject matter which is fascinating to see! Hope you like my quick remark. Keep publishing! The chart is fewer stitches than the width of your foot..
thanks for sharing such good information in you blog.the scarf in the above picture is really a good one.i really want to have that. i really like your blog and the post.i would rather say it is a good work of yours.keep posting.i also like the scarf in the above picture. This one will brighten up those gray wintry days! Such a beautiful scarf! I love the colors! the great thing which inspire me in this blog is the way of sharing some of the useful and usual facts, so I really like it, thanks for sharing. With over 80% of seniors suggesting they want to live at home, this is the most popular option. Many seniors thrive on their own or within a home with family members. your blog is awesome and unique i like it because its really nice Thanks for share. Let me start with saying that your blog entry is very interesting. It contains original and exclusive information. Forward your essay assignment to research paper writing service for a review. However, we will 100% cope with your task! What a lovely scarf! I adore such extraordinary things, so I'm going to ask my grandma to knit me a similar one.